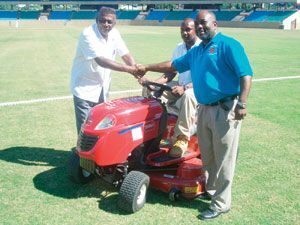 The mower, a motorised 500cc powered equipment, which cost about US$6000, was handed over by President of the Association, Julian Jack, to Manager of the NSC, Osbourne Browne, at a brief ceremony at the Arnos Vale One Playing Field on Wednesday, December 17th. Jack said that the mower was originally sourced to be used on the Buccament Bay Playing Field, but was redeployed after there were subsequent arrangements for development to that facility. The cricket boss also said that the Mower was purchased from funds from the Stanford Initiative. Browne revealed that it was an excellent piece of equipment and was valuable to the Councilâs daily operations, as it will be used for the maintenance of the fields and the preparation of the cricket pitches, at the Arnos Vale, Stubbs, and Sion Hill Playing Fields.